Grangetto's Farm and Garden Supply Services - » Plant Vegetables, Flowers or Both? bi-partisanship, why not do both in the same garden? If taking such a grand leap into the other party’s dogmata is just a bit too scary, why not inch into it? If you are a vegetable gardener, create small arcs of annuals on the outside edge of each corner of the garden, creating a surround of color just as you would your mailbox. Flowers attract pollinators, which in turn pollinate tomatoes, cucumbers, squash, and other fruiting types. Flowers provide nectar and pollen to the beneficial insects which in turn prey on pests. 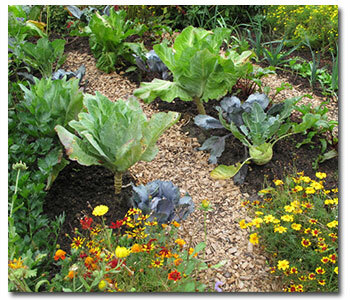 Confuse insect pests searching for their favorite vegetable plants to feed upon by mixing up the beds with flowers. And flowers will attract birds looking for seeds, but who are delightfully happy to settle for eating insects that are unwanted in your garden. This is especially helpful if you’re gardening organicall! Whether your vegetables and herbs are being grown in big, raised beds, in window boxes, or in containers, the same rules apply. We are always searching for a variety of color, texture, and color, along with varying height. Lobelia, with over 350 species, is an ideal addition to any container garden, whether you’re opting for the trailing varieties, with billowing masses of blossoms, or more compact bedding types that seldom exceed 6 inches in height. As they sport ½ to ¾ inch wide flowers that come in red, white and blue, a container filled with all lobelia could be a patriotic nod for your Fourth of July barbecue. Why not add snapdragons for height? Plant them in the back of your container, with a center of herbal plantings, and a border of trailing lobelias. The dwarf varieties grow to about 10 inches, while the taller types grow to a height of 18-24 inches, and come in a fantastic array of colors, from red to orange, yellow, lavender, and white. The bright blue of bachelor’s buttons (also known as cornflowers) is an attractant for pollinating bees. Candytuft, an old-fashioned annual, attracts hoverflies that are excellent pollinators. It also provides nectar for other beneficial insects and a cover for good-guy beetles. The easy-to-grow calendula feeds many predatory insects with its abundance of pollen, along with nectar for butterflies; a visual enchantment. The tall, fern-like cosmos adds height and cheeriness to your late summer veggie garden. It’s a jack-of-all-trades, attracting bees, hoverflies, parasitic wasps, butterflies and many small birds. One favorite annual in a vegetable garden was also a favorite of the Aztecs, who believed that marigolds protected their crops; planting a ring of them around the garden wards off parasitic nematodes. Plant them in amongst the vegetables and they will draw many pollinators and parasitic wasps. They will bloom all summer long, need little attention and come with pompom flowers or tiny, daisy-like blooms. Keep in mind a cardinal rule of an interesting garden, whether it be a vegetable garden or a flower garden, is that variations in height will always be more interesting to view. Start with a border of sweet alyssum which hides the beetles that feed on insects and pests. The flowers are a rich source of nectar for a number of pollinators. Then add in vining and dwarf forms of nasturtium, which are strong pollinators and a great trap crop for aphids. When planted alongside cucumbers and squash, they confuse attacking pests. Top it all off with big, bouncy, colorful sunflowers. They attract many beneficial insects, produce nectar for butterflies, and bring birds to your garden to nosh not only on their seeds, but also on proximal insects. If you have created only flower gardens, flirt with the other side by incorporating edible herbs and vegetables into your beds. Bergamot, or bee balm, is a perennial herb with minty leaves and attractive flowers that will attract bees and hummingbirds. Garlic chives provide a light flavor and scent, and look like tall clumps of grass; their pretty white flowers self-seed prolifically. Combine with onion chives, which sport purple flowers. Scented geraniums provide a wonderful variety of aromas; rose, peppermint, lemon, lime, orange, strawberry, apple, almond, and mint, with a variety of foliage available. As scent is so important to a flower garden, a must-include is lemon thyme, which likes a lot of sun. Mint spreads rapidly, and will tolerate the shadier sections of your flower garden; perfect for brewed tea, and a grand garnish in sorbet. With the recent rise in the popularity of Thai-inspired cooking, lemongrass is a perfect herb to include in your flower garden, with its lemon-flavored leaves that are an attractive blue-green shaded ornamental grass. And of course, our personal favorite, rosemary, with its strong aroma and variegated spikes, adds height, scent and taste to your flower garden. While we dealt here with adding herbs to your flower gardens, there are many vegetables that will accomplish the same ends. Kale and cauliflower add color, texture and taste, especially to your late-season garden. Eggplants have very attractive purple flowers. Lettuce and Italian parsley add texture and fullness to the garden, and will allow you to eat your way through the color! And if you want not only a fresh and delicious vegetable as a centerpiece in your flower garden, but also a conversation-starter, plant the spinach Malabar where it can vine upwards, sporting tiny, purple flowers with beautifully thick green leaves. Pluck the leaves, rinse them off, and pop them into your salad! So, let’s join forces and recognize the assets of both vegetable and flower gardens. When the bill of fare includes color, texture, scent, attractiveness to bees, birds, butterflies and hummingbirds, and taste that enhances our dining pleasure, isn’t it one bill that simply must be passed?